← Why are you envious when the Lord is generous? Living with the secret to reality? 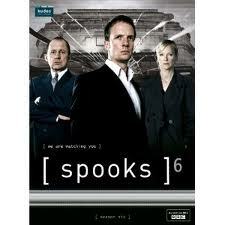 I haven’t been feeling all that great recently which means for the last few weeks I’ve watched more Spooks episode than is strictly necessary. As I walked into town last Friday for the start of Writing Time I was convinced I was being followed, that every white van held some secret agent and that, more worryingly, God was my boss and I was his secret agent. I know. I need to stop with the obsessive watching. It’s got me thinking though. There is something weirdly familiar about the Spooks life (I know I’m not a secret agent really I promise) which I’ve also found in Doctor Who, our other TV obsession of late (we really need to cancel our Netflix subscription). It’s that familiarity of being on the inside circle of what is really going on in this world. Both Spooks and Doctor Who thrive off stories about a small group of people who have the real secrets to the world, who know what’s going on under the surface of our everyday lives. Whether it’s aliens or terrorists they take the conspiracy theories and make them into something true. Weirdly as a Christian sometimes I feel like that, and I don’t know if that’s a good thing or not. It’s easy to get smug about being part of a group of people who seem to know something about the world that others don’t or don’t ascribe to. It’s easy to like being on the inside and to think there is a vast chasm between you and the rest of the world. It’s all too easy to create our own subculture within that group and alienate ourselves from people who aren’t on the ‘inside’, and comfort ourselves with the awareness that we are meant to feel like strangers in this world. Our knowledge should never be about that, but it’s hard to know how it could not be. How can we not come across like a bunch of conspiracy theory nutters or as arrogant in our awareness of the real state of this world? What does it really mean to be an alien and a stranger here? How can we gently peel back the layers to help each other see what is really going on? I guess we start from the perspective that we all need to be reminded. I forget daily that there is more to this world than meets the eye. That there is a big story we are all part of. I forget to rejoice in that and delight in the One who is intimately involved with his creation. I need reminding as much as the next person about this wonderful reality. I need help seeing it and swimming in the wonder of it. I need the layers peeled back and I want to ask the questions that will help others around me see what’s going on in this world. At the end of the day the real job of revealing this world might not be up to us. We have a great revealer after all. He is quite big enough to reveal himself to his creation, and has done. Maybe our job is calling attention to that reality in all we do and say, in questioning what’s going on in this world and in not being afraid to give some answers. The Spooks world is about hiding the true reality away, the Doctor always hints that humans aren’t ready to know the true scope of the universe. Our Maker came to reveal truth to this world. The problem might lie in whether we want to listen or not, whether we’d rather live not knowing. Somewhat paradoxically though there is much of the weird thing called the Kingdom of God that is hidden, that will remain hidden until the final day. Maybe we have to live with that paradox. Maybe we have to live with the tension of knowing the true nature of reality, with the feeling of being a stranger here against the joys and wonder of sharing lives with people who don’t believe what we do, who reject what we hold most dear. 1 Response to Living with the secret to reality? Sorry you haven’t been feeling too good recently: hope you feel much better soon. Really interesting post – I certainly struggle to find the balance between being in the world but not of it: knowing that I can do nothing in myself – and yet having faith that God can use even me. I think it’s maybe a daily giving over and renewal too: often I’ll hit the hay feeling utterly overwhelmed and yet, His mercies are proved new with the morning.